Mobile congregation utilizing a ballroom at the Furama City Centre Hotel upgrades AV system with personal monitor mixing. On weekdays, visitors to the fifth level of the Furama City Centre Hotel in Singapore might likely be attendees of a corporate event or private function in the hotel’s roughly 6,250-square-foot ballroom. But, on any given Sunday, the ballroom is home to the congregants of Redemption Hill Church (RHC). Due to the weekly setup and breakdown, RHC’s techs turn to the mobile myMix personal monitoring and mixing system to simplify rehearsals and performances. Founded in 2008, RHC sought to upgrade its AV system when it began looking for a permanent residence in 2014. However, over the four years that ensued, the scarcity of available land in the prosperous island nation led RHC pastor Simon Murphy to announce that the Centre Hotel’s fifth-floor ballroom would continue to be RHC’s home in the immediate future. But there was still one major issue. Built in 1982, the ballroom housed an outdated loudspeaker system that was becoming insufficient for use by the congregation’s contemporary musical ensemble. 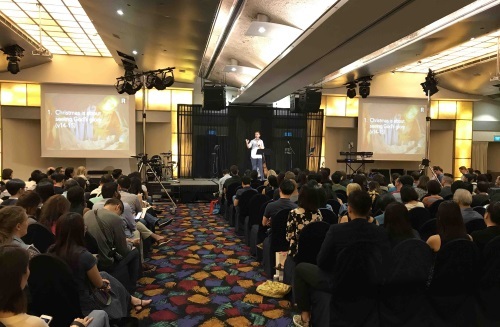 So, with the help of house of worship AV consultant and systems integrator PAVE System, Furama City Centre Hotel worked in cooperation with RHC to upgrade the church’s AV system — allowing the church to employ myMix personal monitor mixing technology — for Sunday services. Two levels below the Furama City Centre Hotel’s fifth-floor ballroom, the headquarters for Redemption Hill Church, located on Level 3, includes office space for RHC’s 17 full- and part-time staff, a purpose-built rehearsal space, and a storage facility housing all the audio, lighting and video equipment used in each Sunday service. At 6 a.m. each Sunday, three hours before the first of three Sunday services, RHC service operations manager Titus Tiong begins transferring the church’s flight-cased console — along with the mobile stage, musical instruments, lighting equipment and two L-R screens for displaying lyrics and images during the services — up to the fifth-floor ballroom using the hotel’s service elevator, where he begins setup by hooking up the console to the recently installed loudspeaker system and establishing a Dante digital network via the amplifier controllers. Due to the labor-intensive setup and breakdown routine, RHC has made an effort to minimize the amount of equipment needed for each service. So, to further simplify the RHC musical ensemble’s rehearsals and performances, Stephen Teo, senior sales manager at PAVE System says that the ensemble — which includes an electric drum kit and keyboards, as well as vocals and guitars — has adopted myMix, which gives the musicians more control over the mix in their in-ear monitors. “Since myMix is easy to use and configure, it gives users the ability to control their own level and they can also control levels of the other musicians they want to listen to without the need to communicate with the sound engineer,” Teo says, adding this frees up the RHC engineer to focus on other aspects of the AV system during Sunday services. In addition, Teo said that the RHC musical ensemble has further benefited from myMix using the technology’s recording and playback feature, which lets users record rehearsals and performances as 24-bit .wav files and then listen back immediately, providing a quick reference for how the practice and performance of their repertoire sounds overall.